The College of Engineering(COEng), together with Fluor Philippines and invited guests from other schools/ universities, partner organizations and selected companies came, and attended Engineering Innovations and Technology Conference (EITC) last November 24 and 25, 2017. 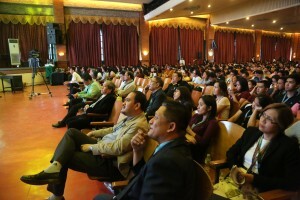 The event was held at the University of San Jose-Recoletos Center for Performing Arts. It is the first conference hosted by the COEng where all its engineering students from across different degree programs gathered in one event. Experts from the industry were also invited to join. The speakers were selected according to their expertise related to the three tracks: (1) Automation, Control Systems and Internet of Things, (2) Materials and Engineering Design, and (3) Business and Technology Management. With its expertise in the field of the Engineering Procurement and Construction, Fluor Philippines brought their experts like Engr. Rudra Rambalack whose knowledge and delivery on the subject matter has been well applauded. Fluor business partners such as IBM and Emerson also participated in this conference. The College on the other hand with its partner schools like Toyo University and Shibaura Technological Institute of Japan, as well as De La Salle University has its share of experts. The Department of Sciences and Technology(DOST) sent one of its directors, Carlos P. David, as one of the keynote speakers. The said government agency has helped the university set up its Engineering Materials Laboratory. Meanwhile, Jeol Asia of Singapore, a company that provided the needed technical assistance to operate the Materials Laboratory, also sent its expert, Dr. Mari Montesa. KEEPING TRACK OF THE OBJECTIVES. Conference participants receive valuable information from national and international experts in this maiden edition of Engineering Innovations and Technology Conference (EITC) sponsored by Fluor Philippines, held at the Center for Performing Arts, University of San Jose-Recoletos. Dr. Virgilio Abellana, the dean of COEng, said that he expects the students to develop innovative research proposals after attending the two-day conference. “Actually, we want to level up the students’ thinking about research. That’s why it is our intention to bring the professors from Japan,” he said. At present, Abellana said that most research papers are still on the basic level that is why he wants the students to learn from the speakers. “Don’t be afraid of mistakes in doing an experiment. Continue to persevere,” he addressed the students in his speech. Engr. Randy Salazar, one of the organizers, and a faculty member of the Mechanical Engineering Department expressed his appreciation and gratitude that there is a company that helped the college realize its dream of conducting a conference with international caliber speakers. “I hope they (participants) really learn something from all of these. Sometimes, we are just in our own world, here, now you see people (experts) talking about things that you may not even know and technologically may seems so far away,” he said. He further shared that the event has long been conceptualized by COEng but the committee had concerns with the sourcing of funds needed in bringing in good international speakers. It is very expensive to bring them into the Philippines. The success of this event, Salazar added, had made him hope to have a sequel of the same conference next year. Fluor-Cebu Operations Manager Maricar Cambaling concurred with Salazar. “We are so impressed. We are very encouraged to do something similar for next year. Maybe we can do this every year. What impressed me so much is the curiosity and the type of questions that they ask. It’s very thought-provoking. We’re happy that Fluor decided to partner with USJ-R,” she said. Engineering Consortium President June Anne Caladcad said she and her fellow officers are very happy to have been part of the activity. “Maybe I can propose (her thesis) something out the topics that were discussed since there’s an increased learning especially on what’s going on in the industry,” she said. Abellana, further expresses his appreciation and wholehearted gratitude, to the partner organizations like PSME-Cebu Chapter, IIEE-Cebu Chapter, ICpEP-Region 7, and PIIE-Cebu, for the support they have given to the conference. The same appreciation is also extended to Emerson Automation Solutions, IBM, Jeol Asia, and NORDE and to the Josenian community, such as the IMC department, CPRDS and External Affairs office and the COEng Faculty and students who have supported contributed to the success of this conference.